With the final push to Christmas now underway, this is probably my last post before the holiday. 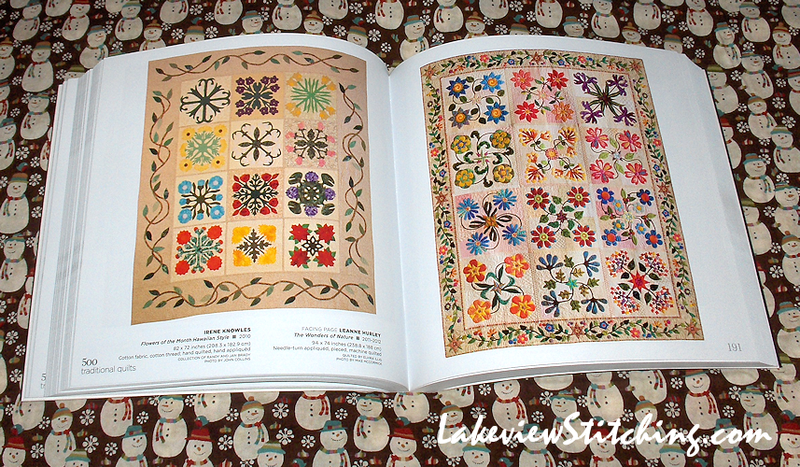 This week I bought myself this book, 500 Traditional Quilts, and I had to share it. Need a little reward after all the cooking is done? Get yourself this book! The title says it all. 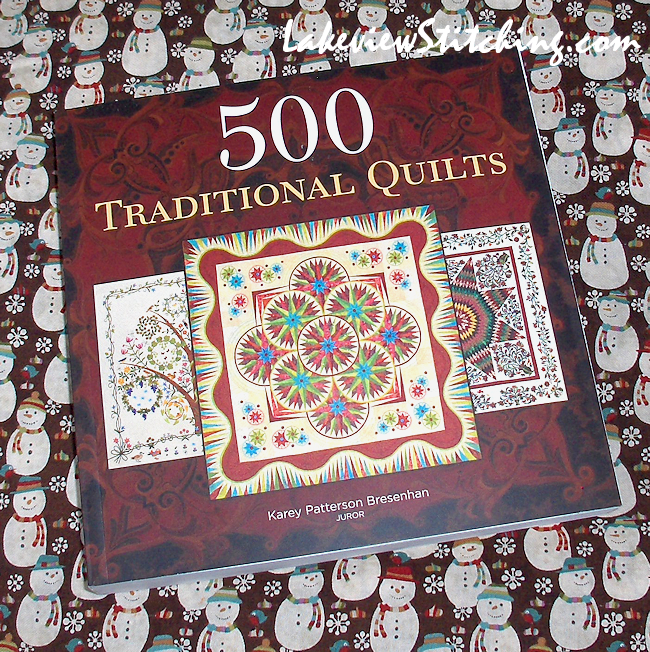 500 full colour photos of the best traditional quilts of today, chosen by Karey Patterson Bresenhan, Founder of the International Quilt Festival at Houston, from photos submitted by the quilters themselves. I only photographed a few pages to give you the idea. 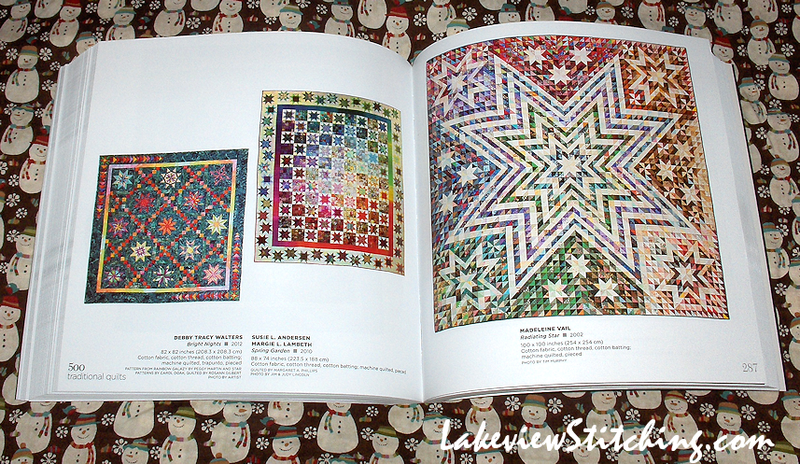 In truth, the book is overwhelming and I needed a couple of sittings to look at it all. There are 432 pages, and it weighs over 2.5 lbs (1 kg)! But what a wonderful resource! The ones on the right above, and left below, are two of my favourites. While most of the quilts are American, and made in the past 7 or so years, there are also quilts from all over the world and as far back as the 1980s. I recognized many of them as Best of Show winners from recent shows at Houston and Paducah, as well as other national and international shows. My only complaint is that I wish there was some way to "zoom in" on some of the details! 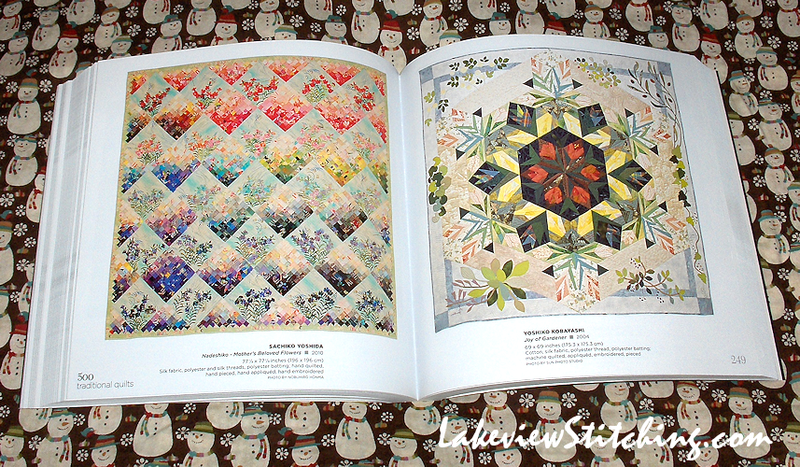 The star quilt on the right is 100" square, and made entirely from half square triangles (HSTs). Best of all, the book was less than $20 on Amazon Canada. Unfortunately, it looks like it is now on backorder. But, it might be in stock elsewhere. I was inspired by Bonnie Hunter's new mystery quilt, in a general way, and more specifically by some of Audrey's recent work. But, there is nothing to show yet. 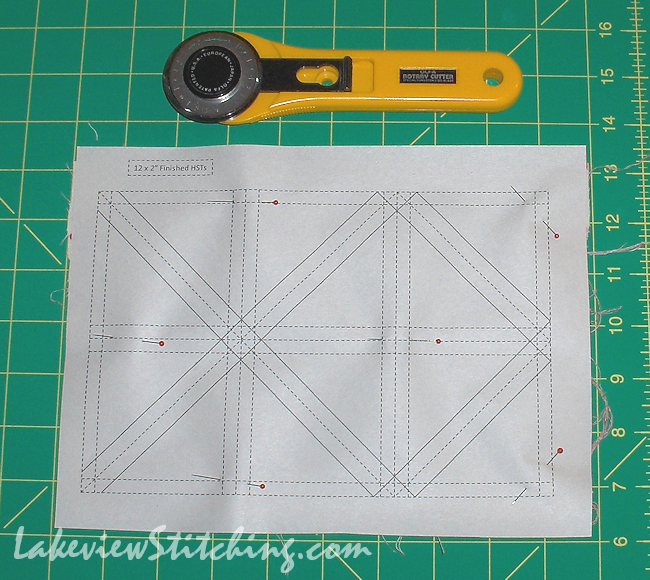 I have 40 of these sets of 12 HSTs to make before I can start to put them together. In the new year, probably! I'll be back after Christmas, but until then, I wish everyone a great holiday -- whatever, wherever and however you are celebrating! Happy holiday! Looks like you have yourself a good read to make it through the slow spots. :) lol Glad to know I can help out with a little inspiration. That's what us quilty bloggers like to do! Its a gorgeous book that I can see you doing a lot with! Thanks, Katherine! It's already helping me to decide what I like and want to pursue, and what I'm not interested in as well! what a wonderful book can see you will browse through that a great deal. Best of luck with all those half square triangles! Thank you for showing us this gorgeous book, it looks wonderful. I must have it too. Hours of pleasure here, Monica. I hope you have much joy of it over the holiday period and beyond. A very Hapoy Christmas to you. Thank you very much, Jillian, and happy Christmas to you too!